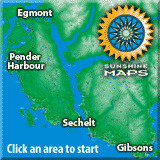 SunshineCoast.ca is the premier mapping site for the Sunshine Coast, British Columbia, Canada. The best detailed maps of Sechelt, Roberts Creek, Gibsons, Madeira Park, Wilson Creek, Egmont and the entire Sunshine Coast. If you are looking for Sunshine Coast Maps, then you have found the site with the best maps of the Coast. The Sunshine Coast Super Map is an integral part of this site. It compiles all that the Sunshine Coast has to offer. From the Roberts Creek mountain bike trails to the hiking trails of Sechelt's Big Firs, the Sunshine Coast Super Map can take you there. Order your own paper copy before you visit us. Discover the seaside community of Gibsons Landing, the many artisans of Roberts Creek, (Check out the new music store Melomania Music! 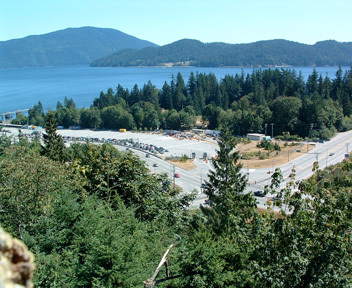 ), the beach-side community of Davis Bay, the Village of Sechelt, "The land between two waters, the havens of Halfmoon Bay, the magic of Madeira Park. Continue your journey to Ruby Lake then up to Egmont and the Skookumchuck Rapids. Backtrack to Earls Cove and on BC Ferries to Saltery Bay where you are only 27Km from Powell River then on to Lund, the end of Highway 101. For more information on the Sunshine Coast, click the navigation links on the left or search the map on the right. If you are experiencing difficulties click here.